Help Coca-Cola take the McDelivery experience to another level! Ordering food to enjoy at home is a growing trend around the globe. Delivery services are offering ever more choices and convenience, allowing consumers to enjoy a wide range of food at home with a single tap on their mobile phone. McDonald’s is tapping into the delivery trend and McDelivery is being rolled out in various countries around the world. 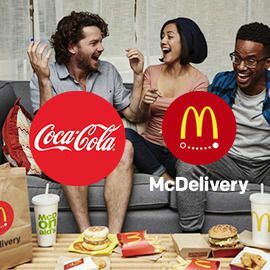 As you may know, Coca-Cola beverages are key in the McDonald’s restaurant experience (think of the combo meal) and Coca-Cola wants to help make the McDelivery experience a great one for people to try and try again. To achieve this, we are looking for ideas that Coca-Cola can leverage to make more people aware of McDelivery and to try and enjoy more surprising and delightful experiences. Can you help imagine what Coca-Cola can do to make the McDelivery more surprising and delightful?